Lawn Boy has an outstanding reputation when it comes to producing gas powered lawn mowers. Any time I get the opportunity to review one of their products I jump at the chance. 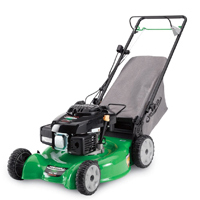 Lawn Boy has a range of models and always seem to base each model around one specific feature.On this one it’s the blade override system, which allows you to shut off the blade without shutting off the engine. If you’re interested in learning more about this model including the features it possesses and how it performs, then continue reading this review. Assembly – Any time a company makes a process as simple as possible, I like them. So when I pulled out this mower and found that all I needed to do was fold out the handle, add oil (which is in the box by the way) and then gas – you can imagine how much I liked Lawn Boy! Size and Build – A 20 inch deck is on the small side for a gas mower but I don’t really think it made much difference. I think the design is nice and compact and the mower is really mobile with its self propel system. In terms of the construction I was impressed.It just feels like quality when you compare it to some of the other options available for a similar price. I especially liked the fuel tank as the mouth of it is extra large, making its super easy to fill up. The deck is pretty good, the wheels are nice and it just seems like it’s been well designed overall. TIMEOUT Blade Stop System – You know those times where you need to step away from the mower for a second, maybe to move something that’s in your cutting path, but you don’t really want to because then you’ll have to go through the process of pulling the starter cord again?Well you’ll never have to go through that thought process again with the Lawn Boy 10605 as it’s fitted with a blade stop system that allows you to stop the blades spinning but leave the engine running.I really liked this because in the past I’ve tended just to risk damaging my mower by running over whatever is in the cutting path – but with this feature I didn’t have to. It’s great if you have kids that are prone to leaving things all over your lawn. Variable speed self propel – This mower weighs in at 79 lbs, which is manageable for me but for other people it could be a struggle. However it is fitted with a variable speed self propel system that ensures you don’t have to struggle.It’s a rear wheel drive system which is great if you have hills or slopes to take care of. On the whole I found the system really easy to use. Kohler Courage XT-Series Engine – The engine on this model is a beast. It works very efficiently only using the amount of power needed to do the job. So if you come up against some thick grass it’ll provide some extra power to deal with it. I also thought that the muffler did a really good job of reducing noise levels. 3-in-1 Cutting System – Do you like to mulch? Do you like to bag? Do you like to discharge? However you like to deal with your grass clippings this mower has got you covered because you can do all three.I really like mulching and the fact then the deck and blade have been specially designed for superior mulching performance really interested me. I’ve never really like being confined to one cutting mode and like the freedom a 3-in-1 system provides – good job Lawn Boy! Cutting Heights – Another thing I really like about the models in the Lawn Boy range is the fact that they cut down to 1 inch. I have seen a lot of other mowers recently that only go to 1.5 inches which I personally don’t think is short enough.Anyway, you have seven different cutting heights available ranging from 1 inch up to 4 inches and you’ll need to adjust the height of each wheel individually. Lawn Boy 10605 Review – How Did It Perform? Cutting Ability – Describing this part of its performance is easy – it was awesome! The engine does a great job of providing plenty of power to deal with all sorts of grass types and you don’t have to worry if you’ve been a bit lazy and let your grass overgrow, as this has the power to deal with it. I also loved using it in mulching mode. You don’t even have to put in a mulching plug as it’s been built into the discharge door – I love that! Grass Collection – I was also happy to see that it bags really well too. There wasn’t a trail of clippings left all over my lawn and I didn’t look like the Incredible Hulk afterwards either. The clippings were deposited nicely into the bag ready for me to dispose of. The only thing I would add is that the grass bag should really be bigger. Manoeuvrability – As I mentioned a bit earlier the Lawn Boy 10605 has a self propel system installed and this makes life so much easier. When using it I found the system really easy to control (although I have used a lot of mowers that have similar self propel systems) and it possesses a variety of speeds.You should be able to find a speed that is comfortable for you. The fastest speed is fairly brisk and although I didn’t get the chance to use this on a hill I can imagine this feature would make the job so much easier. It does say in the instruction manual that you have to adjust the self propel system for it to work properly, so don’t forget to do this before you start complaining that it doesn’t work. Usability – I really got on well with this mower from the word go. First of all there was barely any assembly involved so my first impressions were already good. Secondly, when it came to starting the mower up, it started on the first pull which is always a relief when using a gas mower for the first time.It’s fairly quiet as far as gas mowers go and all the other features it has are very easy-to-use. I do like the addition of the blade brake system, as there are often times you need to step away for just a second and this prevents you from having to start the mower up again. Lawn Boy 10605 Review – Who Should Buy This Mower? I enjoyed using the Lawn Boy 10605 so much that I’m almost tempted to recommend it to anyone that owns a lawn. It’s really that good! Anyway due to its size it is probably best used on medium-sized lawns.It could be used on large size lawns as long as you consider the possibility that it might take you longer because of the 20 inch cutting deck. I’d also recommend it for use on uneven ground such as hills or slopes because the self propel system really works well. Lawn Boy 10605 Review – Who Shouldn’t Buy This Mower? I think this mower would be overkill for a really small garden. The features it has really wouldn’t be needed and I don’t think you could justify the expense. Apart from that I’d recommend it to any other homeowner.This Lawn Boy mower combines a good build with exceptional performance. It has features such as the self propel system and the blade override system that add a touch of class and I don’t think that the mower is overly expensive for what you get.If you are interested in purchasing one for yourself, go to Amazon and they will hook you up for the best price going.